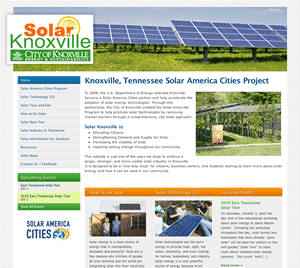 In 2008, the U.S. Department of Energy selected Knoxville become a Solar America Cities partner and help accelerate the adoption of solar energy technologies. 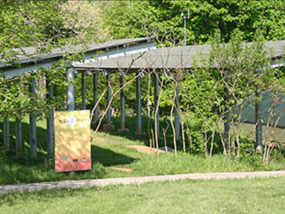 Through this partnership, the City of Knoxville created the Solar Knoxville Program to help promote solar technologies by removing market barriers through a comprehensive, city-wide approach. Inspiring lasting change throughout our community. This website is just one of the ways we hope to achieve a larger, stronger, and more visible solar industry in Knoxville. It is designed to be a “one stop shop” for citizens, business owners, and students wishing to learn more about solar energy and how it can be used in our community. Solar energy is a clean source of energy that is inexhaustible, abundant and powerful! Here are a few reasons why millions of people all over America and the world are integrating solar into their electricity and heating systems. Solar technologies use the sun’s energy to provide heat, light, hot water, electricity, and even cooling, for homes, businesses, and industry. Solar energy is a very powerful source of energy because more energy from the sun falls on the earth in one hour than is used by everyone in the world in one year.